In order to reach current and potential new Porsche Club members the Maverick Region has set up a Digital Signage Network. It currently has 7 locations with 1 or 2 more to be added in the future. The idea is to reach Porsche owners where they are most likely going to be: a local Porsche Dealer, a local Porsche repair shop or at the track. The content is made up of slides that rotate through at 15-20 seconds per slide. URL's and QR codes are used to interact with viewers. 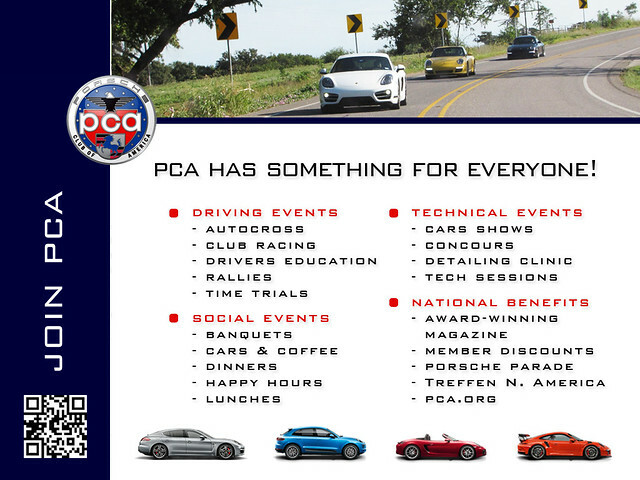 The first 15-20 slides are about what PCA has to offer Porsche Owners. The rest are ads for upcoming events. Below is a sample of the slides.